Funny man Jimmy Fallon surprised Parkland students when he showed up and gave them a moving speech about their future and their bravery following the fatal shooting they witnessed in February. 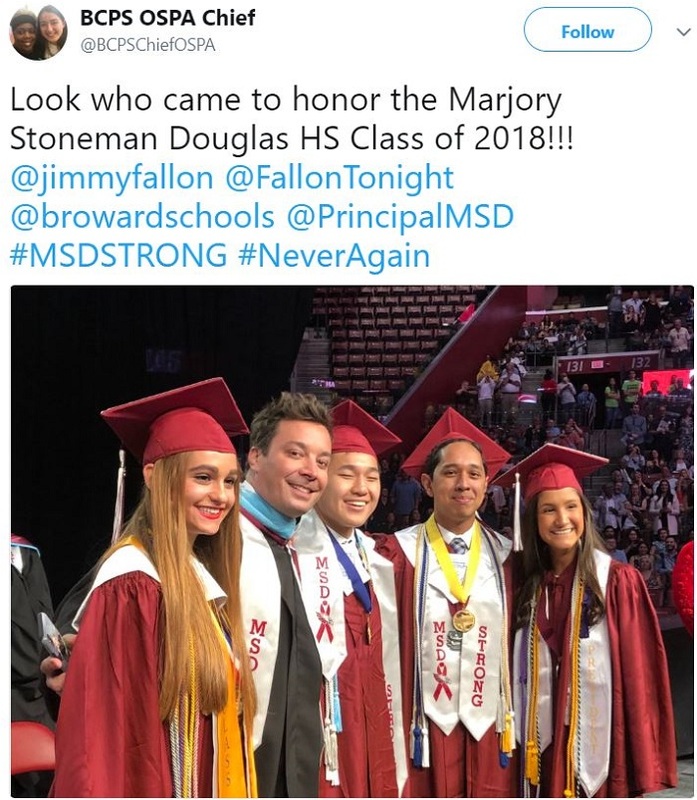 Funny man and Tonight Show host Jimmy Fallon surprised his teenage fans at the Marjory Stoneman Douglas high-school when he crashed their commencement ceremony and gave a moving speech. During the ceremony, that was held at the BB&T Center in Sunrise, Florida on Sunday, Fallon 'crashed' the event as a keynote speaker and moved the audience, applauding students for their participation in 'March for Our Lives' this last March. The students were wearing sashes that read "MSD Strong" as memorance of the 17 people killed during the shooting in the Marjory Stoneman Douglas high school in February. During his speech Fallon spoke about the student's future, saying "You should feel incredibly proud of yourselves. That doesn't mean you should rest on your laurels — or your yannys…Some of you will grow up to hear yanny, some of you will grow up to hear laurel, but the most important thing to know is that neither of these things will matter by the end of the summer. Here's what will matter: you, the class of 2018, will have graduated. And you won't be classmates anymore. You'll be adults who Facebook search each other at two in the morning for the next ten years." The famous host has been an avid supporter of the school's students after the fatal attack on their classmates, and in his speech gave hope to the surviving students whose lives changed on February.